My whole body trembled, while my heart peeked past the fingers sheltering it. I wanted to hide in the locker room. A crowd always makes me tremble. But I pressed forward, one step at a time, through the parking lot, through the grass, until the sky opened up. Two little trusting bodies tagged along. Tables had been placed everywhere, and people scattered here and there, passing out flyers of information. Some in a hurry, some sitting and talking, some eating. “Let’s get you all signed up,” said the lady. “Okay,” squiggled out of my mouth. I would have been biting my nothingness of a fingernail had I not been holding my littlest. I always held her, or at least held her hand, because I didn’t want her falling. She’d been hurt enough. And the chemotherapy she’d taken—Vincristine—had damaged her ankle strength. Her tiny one-year-old ankle strength. Vincristine … sounds like such a sweet name, doesn’t it? I have a love/hate relationship with Vincristine. It helped kill any wandering cancer cells for which I’m so thankful, but I didn’t like the big hook that went into my baby’s chest for each treatment. And I didn’t like the way it weakened her walk, in every aspect. Vincristine treated her good, and Vincristine treated her bad. “Here are your T-shirts. Everybody put them on.” The lady smiled. I evaluated my Relay for Life T-shirt, wondering how I’d wear it over my overalls, while my oldest daughter put on hers. The littlest got the cutest T-shirt with a kid in a cowboy hat, riding a stick-horse, and it proudly displayed the most beautiful words: Kids Kickin’ Cancer. At now three years old—the youngest cancer survivor. I must have bit my lip. And then I might have scrunched my nose. Being the youngest cancer survivor is such an honor. Or is it? 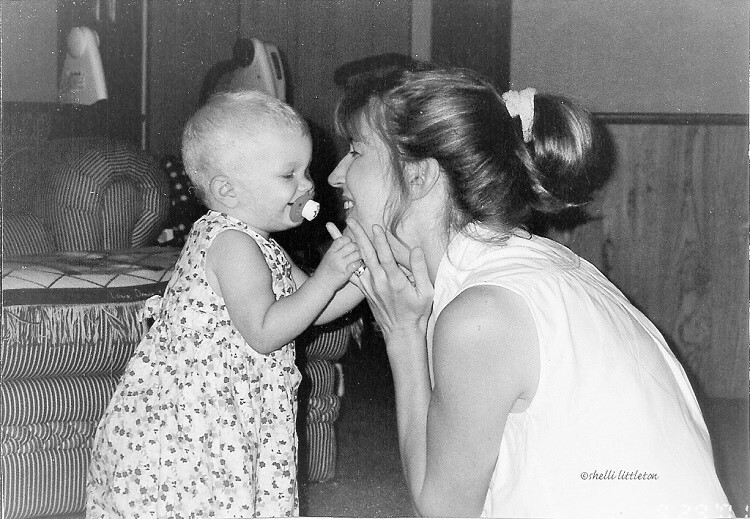 Good to be a survivor … bad to have cancer … What baby should ever have cancer? I was still making my way through the whirlwind. Trying to figure it all out. What have we just endured? Oh, God, what have we endured? I’d been so tough until a year or so after it all. And the pictures of hair loss, paleness … it just all came washing over me. I lost it. Working on that baby’s photo album, I lost it. 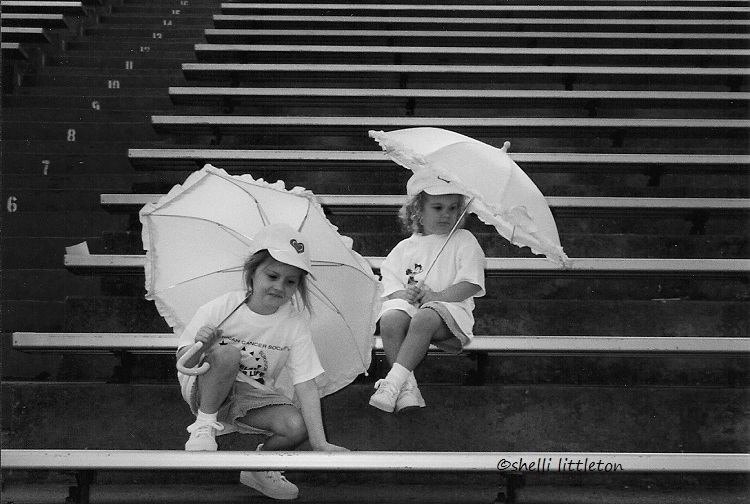 “Okay.” We placed our belongings down on the stadium bleachers. The girls opened up their pink umbrellas to fight off the Texas April sun. Look at those curls on one. And look at that proud sister smile on the other. And just like that, we were up. 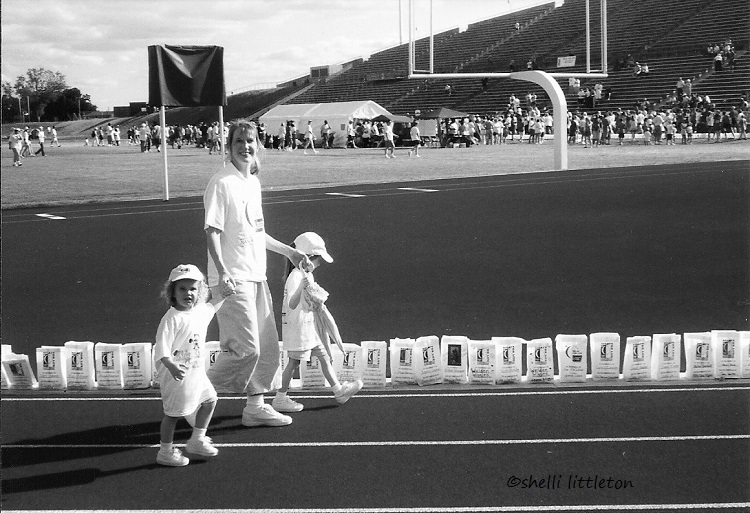 We began walking the lap around the stadium track. I held my littlest’s one hand, and her big sister held her other. She would not fall. And my cautious expression eased to a smile at the love and friendliness that welcomed our baby. And then hands began to clap, as pictures were taken, and military men began performing what my heart could barely take—they fell down to their faces and began push-ups. People we didn’t even know. They fell to their faces. Tears gathered in my eyes and air seemed scarce. As we made our way to the other side of the track, those people walked to the other side, clapping, and the men in uniform ran to the other side to fall to their faces again. When the caregiver lap began, they did the same. And more tears. More clapping. More push-ups. My heart felt overwhelmed at the love shown to the youngest cancer survivor. But I especially couldn’t believe the love shown for me. Because every ounce of effort I had made on my littlest one’s behalf was out of love. 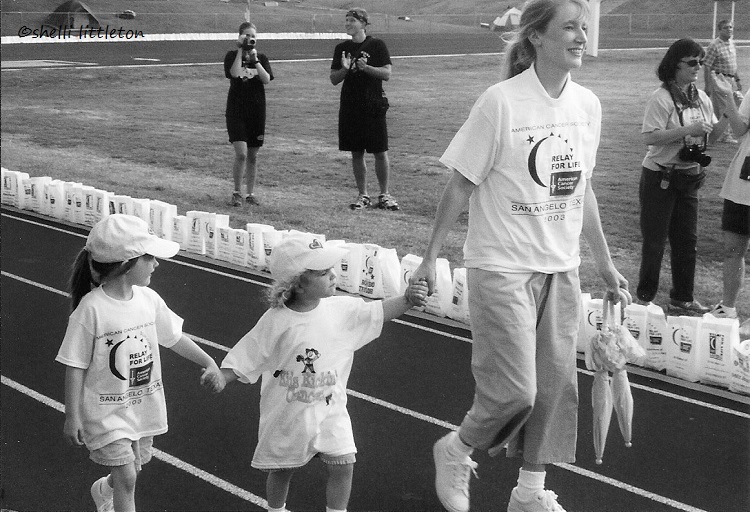 I had only done what any parent would do … to the youngest cancer survivor.